After an evening of precursory tremors, a magnitude-6.1 earthquake struck western Iran today at local time 4:47 a.m., according to the U.S. Geological Survey (USGS). USGS upgraded its estimate for the event today from a previous estimate of magnitude 5.6, now classifying the earthquake "strong," (earthquakes between magnitude 6 and 6.9). At least 66 people were killed and more than 1,200 people were injured, according to Reuters. That story also noted that the death toll could have been higher, but the tremors felt the night before led some residents to evacuate from their brick and mud homes, many of which were destroyed. 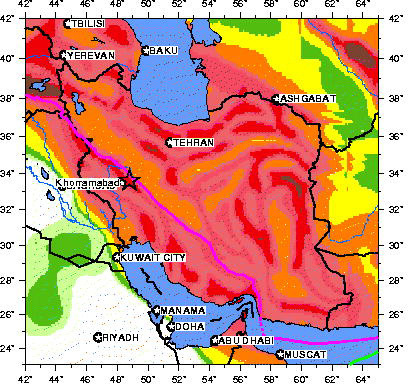 The epicenter today's earthquake, shown here as a red star, on a seismic hazard map of Iran, demonstrates that today's magnitude-6.1 earthquake occurred within a highly active (denoted by red) region of Iran. Green and white regions denote less hazardous regions. Image is courtesy of the U.S. Geological Survey. Shaking was centered about 45 kilometers east of the Khorramabad and 335 kilometers southwest of Tehran, according to USGS, and Reuters reported that 330 villages sustained damage. The shallow depth of the earthquake, only 10 kilometers deep, may have contributed to that damage. Earthquakes are not uncommon in Iran, where the Arabian and Eurasian plates collide, riddling the country with seismically active faults. The last significant earthquake shook Iran Nov. 27, according to USGS. The magnitude-6.0 event killed 13 people on the island of Qeshm, where 80 percent of the buildings in the island's village of Zirang were destroyed. In December 2003, a magnitude-6.6 earthquake in Bam that killed about 30,000 people. That event drew attention to the hazard posed by the ease of collapse of the country's poorly built homes (see Geotimes, December 2003), a problem again made evident by damage after today's earthquake.